As Chinese phone maker Meizu approaches its eleventh anniversary come March 14th, its notoriously reclusive founder Jack Wong made a surprise return -- in front of cameras, no less -- to his company's Zhuhai headquarters this weekend as CEO. Wong, who is now 40 years old, has apparently avoided setting foot in his office for years -- he even used to leave home just once a month to get his haircut, and he only held meetings with just a handful of key employees, according to our sources. During yesterday's recorded Q&A session, the slightly brash yet charismatic exec confirmed this odd little fact, blaming a series of events several years ago that led to exhaustion. But now he's ready to go full time again, instead of just occasionally posting on his company's online forum and designing prototypes at home. "I plan to lead everyone, lead Meizu, lead the whole team to make a new start, to a more extraordinary, more prosperous 10 years," Wong said in front of his employees. The reason for Wong's return is because of several resignations from the management level. According to an earlier internal e-mail during Chinese New Year, the reason for Wong's return is because of several resignations from the management level. Luckily, that lot excludes the previous CEO Aber Bai, one of Meizu's earliest engineers, who remains at the company to assist his successor. We also understand that those who resigned weren't seniors, but the returning founder cared just as much about his company's lost talents. Wong's first objective is to get his one billion yuan (about $165 million) funding, which will eventually help him list his company, as well as attracting more talents and developing more connections in the industry. He confessed that finance was never his strong point back in the day, even when Lei Jun, an investor of Meizu before starting rival company Xiaomi, tried to convince Wong that stock options are beneficial to the company and its employees. "I recall some years ago, when Lei Jun was still at Kingsoft, he told me that even his driver was already very rich (by buying stock). I didn't quite believe it then, but today, I really believe it," Wong said, before taking another puff on his cigarette while his team applauded. Li Nan (pictured above), VP of Marketing and Sales, said earlier that Meizu's been operating just fine without funding over the last ten years. The exec claimed his company's selling around 300,000 to 400,000 units per month these days, covering markets in China, Russia (with three flagship stores), Ukraine, Israel, Saudi Arabia and Hong Kong. This year, Meizu aims to crack the North and South American markets, with the former already initiated with e-tailers Light In The Box and Amazon, as well as a Best Buy-like chain store. Li added that while there's a growing demand for unlocked smartphones in the US, his company's also talking to the carriers there for potential partnership. "You must believe in me... you'll never find a better Meizu leader than me from the mainstream lot." Both Wong and Li confirmed that Meizu will continue its one-year product cycle, while offering a refresh model in between. Shortly after CES this year, Meizu posted a few photos of its flagship MX3 phone running on Ubuntu, which suggests we might see an Ubuntu-powered MX4G -- as Wong's been calling it in his forum -- this summer. Li couldn't comment on this matter when we asked him about this, but he did point out that Meizu fans remained loyal despite the shift from Windows CE on the controversial M8 to Android since the M9. We'll take that as a hint at a somewhat customized version of Ubuntu on the next Meizu phone. Looking ahead, Wong said the US is still the top place to be for technology companies, and he hopes to set up an R&D center there to stay ahead of the curve. The founder even joked that had he returned to work full time sooner, maybe it would have been Meizu instead of Lenovo buying Motorola. "You must believe in me," Wong said to his employees as he was wrapping up the event. "I'm a non-mainstream. 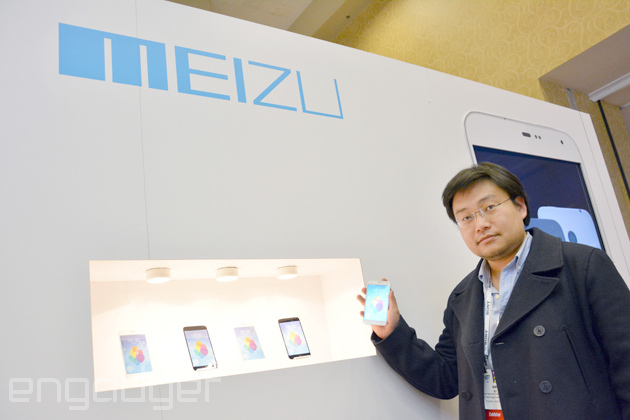 Non-mainstream as in you'll never find a better Meizu leader than me from the mainstream lot." If you want to see the rare footage of the once media-shy Wong in action (and don't mind a bit of Mandarin Chinese), then head over to the source link below.